Brad Towns (Has 11 Teams Left in his Bracket): This is the type of game I have been looking for for a while. I love that we can shoot the 3 with the best of them but this team is capable of so much more and they showed it against Ohio State. Galen Robinson led the charge attacking the basket early on and we didn’t let up. Galen consistently beat his man off the dribble and took his shot when it was there and dished when it wasn’t. All of Galen’s shots were in the paint and he finished 6 for 9 from the floor. He also added 5 assists and 6 steals. It was his best performance in the biggest moment of his career. 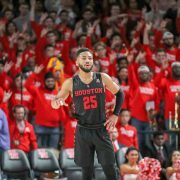 Ryan Monceaux (Also Has 11 Teams Left): Galen is a big part of the fact that the Coogs outscored the Buckeyes 34-12 in the paint (74-32 differential in 2 games). But I thought his defense was the key last night – his 6 steals are a career-high and helped set the tone for the game early. 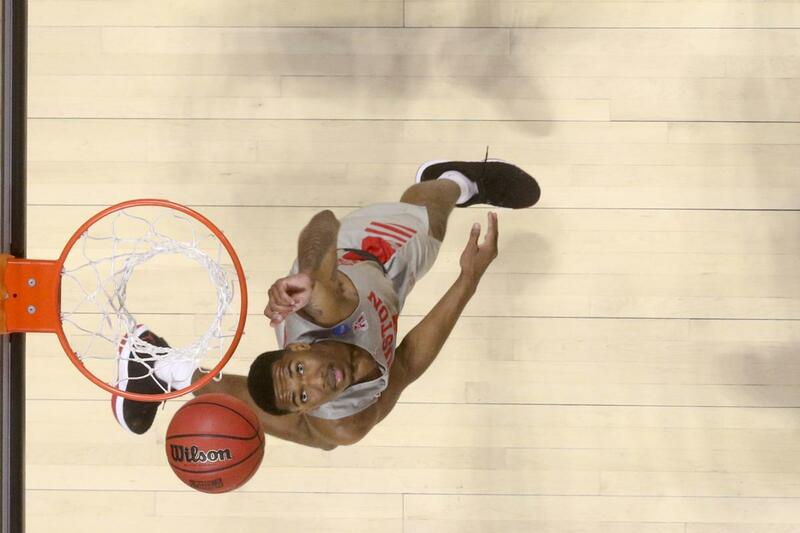 This UH team doesn’t get outscored from three-point range by 15 but it happened last night. But even that didn’t matter. Towns: For the game we only took 19 three-pointers. That is a crazy low number when you realize that we average 26 attempts this year. Monceaux: If I had told you we hit one three-pointer in the second half, you’d say we lost, right? 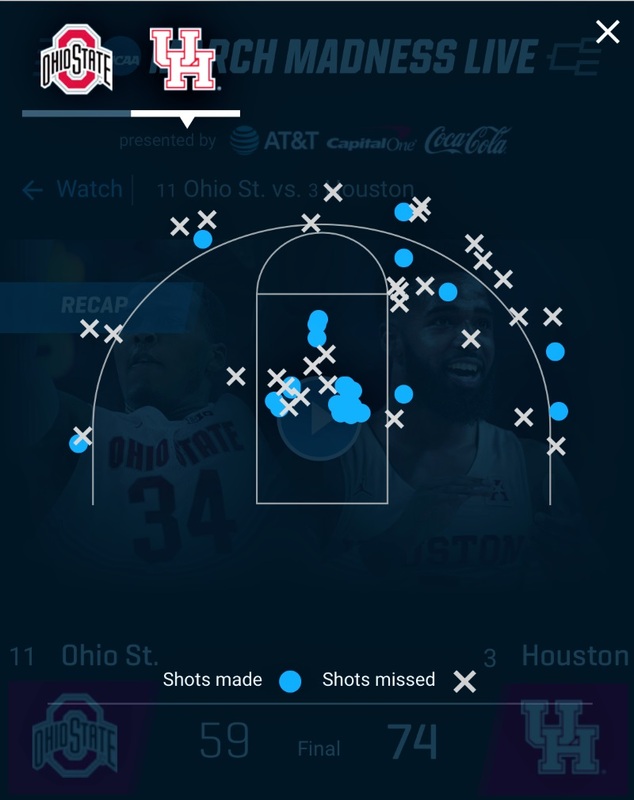 But that’s exactly what happened – the Coogs didn’t hit a three in the last 13 minutes. And win by 15. Towns: Adjustments were a big key both prior to the game and in the 1st half. 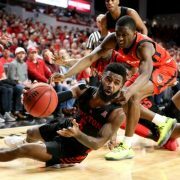 This team took an important lesson from the UCF loss: just because a team is big inside doesn’t mean you can’t attack the basket. Monceaux: Yeah. Ohio State definitely had a size advantage over the Coogs but it didn’t matter. UH hit 21 shots from inside the arc compared to just 9 for the Buckeyes. In the second half, as we’ve seen so many times this year, the opponent got flustered and started taking bad shots. Watching the game, I thought that OSU’s offense came-off as two-dimensional. They’d take shots from the top of the arc and then close-in. It turns out, that’s pretty much their entire offense. 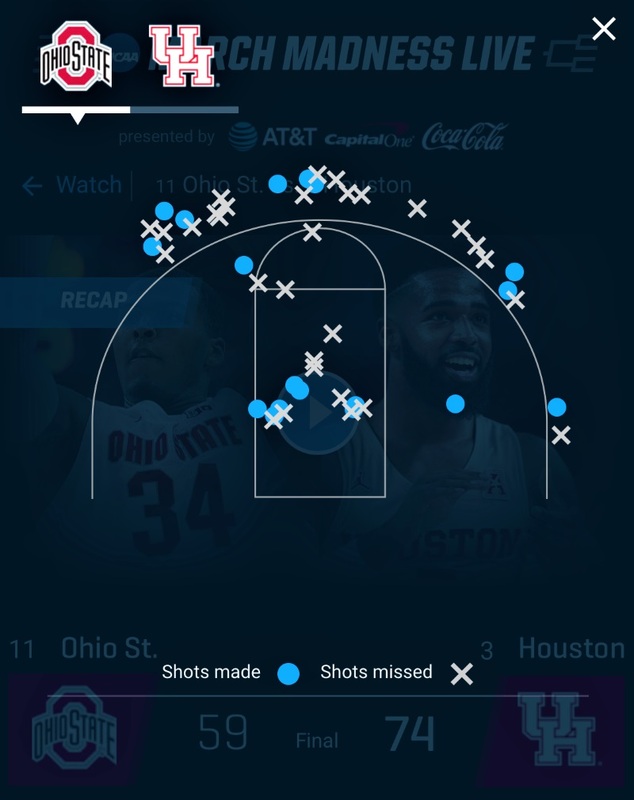 Compare that to UH’s shot chart – with makes from all over the court. This team’s speed is a great equalizer. Look at all those baskets from inside – how often did Galen and Corey blow by a flat-footed defender? Or go the length of the court? Probably 10 times and got 7 buckets out of it. And that speed creates opportunities on the defensive end, too – usually it’s in transition and outside on the arc. But last night, it was causing havoc inside. Towns: For sure. The UH defense started the game focused on collapsing and shutting down the inside game. OSU took advantage early – they were white-hot from 3. 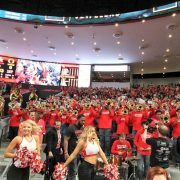 At the 9:56 mark of the first half, OSU hit a 3 to take a 24-21 lead and were 6 of 9 from long-distance at that point. The Coogs made an adjustment and OSU was just 4 for 20 from three the rest of the way. 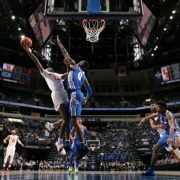 Monceaux: Ohio State went over 8 minutes in the second-half without a bucket but were kept in the game by free throws. They missed all 5 shots in that eight-minute stretch but were 9/11 from the line in that span. That accounted for 9 of the 11 makes from the line they had in the entire game. Friday night will be a war.